ON A journey to the future, a team of young Australian adventurers stopped off in Gympie this week to recharge their batteries. Expedition members Julian O'Shea and Rebecca Watts are on a pioneering voyage from Melbourne to Cairns to prove the feasibility of affordable solar and plug-in power for vehicles. 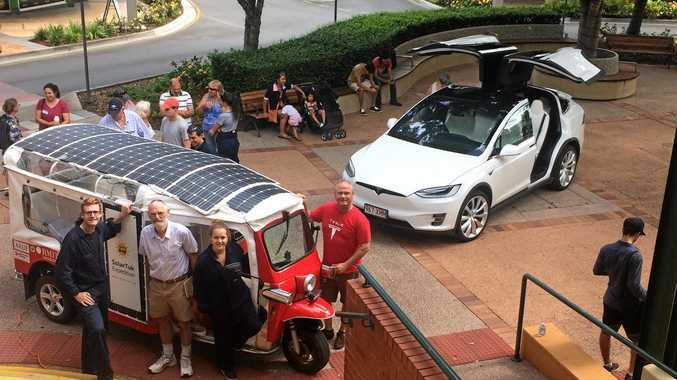 They chatted to passers by and displayed their converted Thai-origin "tuk tuk" vehicle, as they took a break from Australia's first transcontinental solar-powered voyage. Their budget technology attracted the attention of Gympie solar enthusiasts Murray Keys and Warren Polley, of Polleys Coaches. Mr Polley added contrast to the spectacle by bringing along his new Tesla electric vehicle, which he admits is not quite as affordable as a lithium battery tuk tuk. "But a lot faster and more comfortable," he said, admitting that his decision to purchase the vehicle was based as much on enthusiasm and curiosity as any practicalities. The technology is not yet affordable enough for the buses his company runs, but will be, he predicts. And, despite the expense, he regards his Tesla as "the best thing I ever bought". "It's one of those vehicles that's as much fun to talk about as to drive," he said. He is absolutely behind the 3000km tuk tuk adventure. The SolarTuk was officially unveiled at Royal Melbourne Institute of Technology in October, backed by the RMIT University's School of Engineering. Mr O'Shea, an engineer who is leading the expedition, says he wants to encourage Australians "to find more sustainable ways to live, work and travel. "We think electric vehicles have a role to play and would love to see a transition to greener forms of mobility." He and Mr Polley agree that electric vehicles have introduced a new word to the language - range anxiety. But they say it is, like many such conditions, mostly in the mind. "I just plug in overnight," Mr Polley said, referring to the 300km he can expect to get on one charge from his luxury vehicle. And the solar voyagers admit they may sometimes have to do that too. "We have met a lot of friendly people, some with power points," Rebecca Watts said as they all rested at City Centre Stage in Mary St.